And here comes the part 2 of "Some post-Halloween photos that may be useful for Halloween 2016". - -- my Halloween daytime walk. Many kids like Halloween. - -- Halloween things: Halloween masks, Halloween toy-axe, jack-o-lanterns, etc. - -- a Halloween witch broom. I saw it for the first time that day. - -- 2 Halloween masks and a Halloween pumpkin (a jack-o-lantern). - -- a Halloween witch hat, some Halloween toy-fingers and a lovely teddy bear with Halloween jack-o-lantern costume. Also you may notice a Halloween vampire, etc. - -- a Halloween skeleton costume for kids. - -- an interesting Halloween pumpkin hat (jack-o-lantern hat). - -- a young woman is trying a Halloween mask. She thanked me for taking this photo. A bit western Halloween spirit now. Let's see a photo from the West (How I know it's from the West? The prices are in Euro and the tags are in English ). 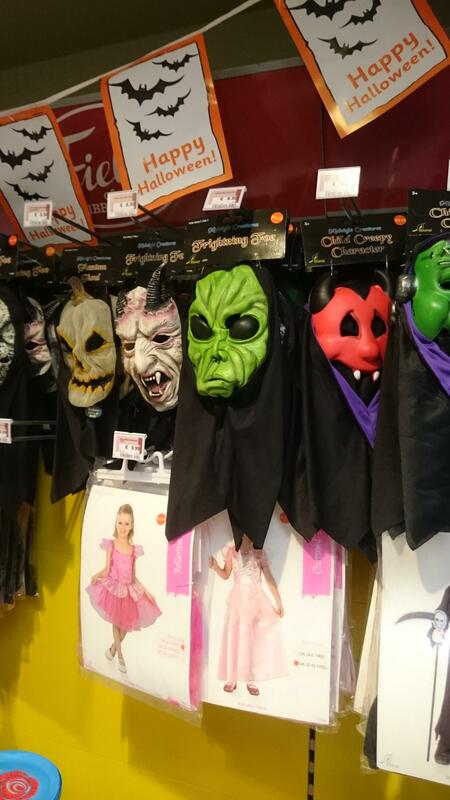 Halloween masks: -- "Child Creepy Character", "Frightening Foe", "Phantom Ghoul", etc. Continuing posting/uploading/sharing the pictures from that last Halloween. - -- Halloween decoration with pirate flags ('Jolly Roger'. More about it: https://en.wikipedia.org/wiki/Jolly_Roger). - -- Halloween decoration with Halloween Doraemons and Jack-o-lanterns. - -- A boy watching a Halloween wall decoration (Halloween spiders and a Halloween spiderweb). - -- Two 'Jolly Roger's. - -- A Halloween pirate skull mask on the wall. - -- Halloween Doraemons, Jack-o-lanterns and a Halloween bat. - -- more Halloween spirit. - -- well, not exactly a Halloween thing, but pretty pretty. A big artificial toucan. More about these birds (toucans): https://en.wikipedia.org/wiki/Toucan. - -- Halloween pumpkins decoration (Halloween Jack-o-lanters decoration). - -- not a Halloween one, but I like it, because of the pumpkins (and also -- coconuts and pineapples). - -- I expected that place to be full of Halloween stuff, but it wasn't... Well, at least the emptiness gave me some Halloween 'feeling'. Something like those 'haunted houses', you know. Pretty Halloween symbol. - -- Some Halloween cosplayers. - -- A Vampire palace, bats, etc. - -- Smiling Jack-o-lanterns. So lovely! -- -- Halloween cross, Halloween 'RIP' (gravestone, headstone or tombstone) and Jack-o-lanterns. - -- a cool magic/wizard/witch/oracle Halloween table. - -- From another point of view. These hanged frames are so ghosty. - -- The same place. - -- Remy Martin (a French firm that primarily produces and sells cognac), skulls, crow, spider, spiderweb, etc. - -- Inside of the bar. Good Halloween decoration. - -- I like these green Halloween ghosts hanged above. - -- The waiters' uniforms. Sailor uniforms and a Halloween vampire bite (on the neck of the waiter). - -- very good Halloween interior. Halloween skeleton couple. - -- a little Halloween angel girl in front of the big Halloween clock. - -- she and another one -- a little Halloween witch in front of that clock. - -- the same 2 Halloween cosplayers. - -- the Halloween night of 31.10.2015 here. - -- good Halloween ad, good Halloween drinks. - , , -- some photos of the jack-o-lanterns on the tables. I like them. - -- a blurry Halloween photo. - -- the same Halloween atmosphere (a non-blurry photo). - -- it's a wonderful Jack-o-lantern, isn't it? - -- Halloween spiderwebs, Halloween flags. Really nice Halloween exterior! - -- Black and orange jack-o-lanterns. - -- one of my Halloween night cocktails next to a Jack-o-lantern. - -- from another point of view. Good time. Halloween time. - -- a real Halloween cocktail named "Brain tumor". Price: RMB 32. - , , -- 3 more jack-o-lantern photos. Some of them with flash, some of them -- without flash. But all of them are awesome Halloween photographs! Wow... more from the same place: , , , , . - -- a good Halloween column decoration in the same place. - , , , -- 4 different photos (including -- blurry ones) of the orange and black jack-o-lanterns mentioned above. - -- a very pretty lantern. Good for Halloween, for Christmas, for New Year. - , -- the Halloween paper bowls in a local KFC. - -- a llama in the Halloween night. - , -- 2 photos of the Halloween night sky. I think the 2-nd photo is really a photo with a great Halloween spirit. Some more my Halloween photos. My last Halloween wasn't so great, because I didn't go out in the evening and I spent the night at home (I wasn't able to find a person to join me and I decided to stay at home, because I had to get up early next morning). It was kind of sad, but... nothing is perfect. 1. For the first time I ate some Halloween candies. 2. Two home-made Halloween pizzas. 3. A Halloween present (the 3-rd photo). 4. I sent "Happy Halloween!" messages to some friends and relatives; we chatted about Halloween, as well. 5. I watched some Halloween pictures online. Better than many other people around the world, who don't celebrate it or even hate this festival. I think it's an example for good Halloween toys -- Plants vs. Zombies toys: a photo -- . Made in China. 3+. Well, it wasn't very great this year, but I love Halloween, so I think I am satisfied that I had another, new Halloween in my life. - Halloween words: "candy", "Halloween", "Happy Halloween! ", "jack-o'-lantern", "werewolf", "ghost", "black cat", "witch", "bat", "spider", "zombie", "owl" and "vampire". - non-Halloween words: "Hello, Dotty! ", "zero" (the rest of them are clear). 2. -- this bar usually has good Halloween decorations, but this year disappointed me, because its decoration wasn't that special + the waiters said that the lowest price for a table is RMB 700 (one has to order drinks at least for RMB 700) otherwise no way. So, I left it and I told them I'm not that rich (currently RMB 700 = USD 100.35)... and continued to walk to other places nearby. 3. 1. -- "Halloween Happy", 3 jack-o'-lanterns, 2 ghosts, 2 bats and a witch hat. 3. 2. -- "Happy Halloween", pretty lovely witch, trees, ghosts, pretty moon, bats, haunted house, graves, Jack-o'-lanterns, a skull, letters with eyes. 3. 3. -- "Happy Halloween", "Trick or treat", red bat, a spider and its spiderweb, and many jack-o'-lanterns, including a flying one (a vampire pumpkin) and one with a witch hat (a witch pumpkin). 3. 4. -- Halloween flags, a girl in pumpkin costume with a pumpkin cart full of sweets, colorful stars, lollipops and candies. 4. 1. -- black balloons, ghosts, jack-o'-lanterns, bats and an innovative "Happy Halloween!" 4. 2. -- black, orange and a witch. 4. 3. -- Halloween balloons with different colors and different pictures, and a Jack-o'-lantern with a witch hat. 4. 4. -- jack-o'-lanterns (one with a witch hat and one with a white ghost) and balloons (black, orange and white). All above the "It's fresh". 5. Then I decided to visit another popular bar with (usually) good Halloween decoration, but I was also disappointed that all the time some of the security guards followed me everywhere (even to the WC). Well, I decided not to stay there, because I don't want to be treated like this and I don't want people to think I'm dangerous. I'm a philosopher, a poet, a web-master a writer. I think I'm a high-quality person, not a thread. But at least, I took some photos and I'm glad that they didn't mind (well, they asked me what photos I'm taking there and I answered the truth --- it's for this website, because I like Halloween and I am eager to show as more as possible Halloween photos). 5. 1. -- the entrance. A big mouth of a dragon or a monster. I don't know. 5. 2. -- bloody hands (zombie hands) and scary jack-o'-lanterns. 5. 3. , -- an electric oracle ball, a zombie hand, an old phone, etc. 5. 4. -- a lot of small pumpkin lights and spider webs, -- a skull lantern, -- a good singer (with bodyguards), -- a blurry photo. I don't know what I saw there in fact, but I have it, so better not to waste it. -- a giant mask with spiderweb. -- a jack-o'-lantern style lantern. -- another jack-o'-lantern lantern. -- a pretty colorful light. 6. 1. -- another pretty lantern (similar to the one I have). It has a pumpkin scarecrow, jack-o'-lanterns, a tree, a fence and a lot of bats. 6. 2. -- lovely Halloween toy (with candies) with a jack-o'-lantern head plus witch hat (and red light). 6. 3. -- a lovely jack-o'-lantern with a witch hat and a broom. 6. 4. The doors and the windows of this supermarket have very cool Halloween decoration, have a look: , . 7. Then I visited a cafe (fast food cafe). 8. Well, I found a new bar (at least new for me) with interesting Halloween decoration, but it was already late to go inside. Anyway, I'm glad that I got some photos. 8. 1. , , -- "bloody nurses". 8. 2. -- some scary subject with spiderweb. 9. 1. Halloween balloons and Halloween symbols: , -- "Spooky", "HAPPY HALLOWEEN", bats, pumpkin, etc. 9. 2. , and -- good public Halloween decoration. 10. Pretty Halloween flags decoration: . Wow, it was not easy to upload and show so many Halloween photos! But I did it! HAPPY HALLOWEEN!! !